Ag-Data has the facilities to perform repairs on almost every make of IBM compatible personal computer and most types of printers. Together, our A+ Certified Service Technicians have over 30 years experience in diagnosing and repairing computer problems. 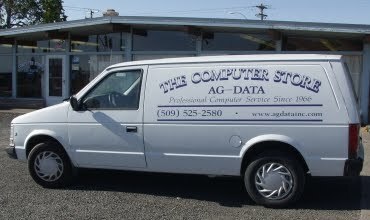 Ag-Data has made a commitment to provide the best service and support possible. Prompt and expert repairs of your computer or printer are important to you and us. Our on-site or in-shop service will get your computing equipment operating at peak efficiency. We can be reached by phone from 8:30 a.m. - 5:30 p.m. Monday - Friday, excluding national holidays. We can also be reached by email. If you wish, stop in and see us. We are located about 3 minutes from downtown Walla Walla at the intersection of Isaacs Avenue and Tausick Way near Walla Walla Community College.